Bring your own device allowance into work places has shot up from 72 percent in 2011 to 95 percent in 2012, according to Spring Technology. When you switch from a completely employer controlled device policy to a BYOD policy, your overall small business IT environment changes. You have a great deal of flexibility, but the security challenges you face are also significant and require work culture changes. Small businesses may not have the operating budget for a large IT department, or any IT department at all. When you can’t issue employees the equipment that you’d like them to be using, it’s convenient when they bring in their own devices to take care of the gap. Tablets, smartphones, and laptops are common devices to fall under the BYOD policy. According to The Daily Attack, another way that small businesses benefit is by avoiding the need to maintain all of the equipment. Each employee is responsible for his or her own updates and software deployment, enabling you to focus your attention on other aspects of the business. 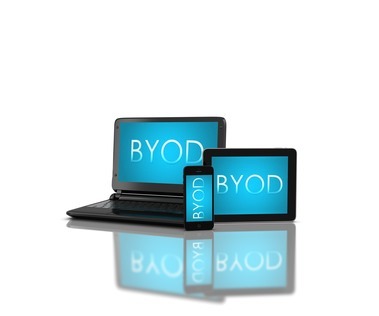 BYOD policies also increase productivity due to device familiarity. Instead of training your employees on a new system, the most you’re doing is showing them a few new apps that you’d like for them to use during their day-to-day activities during work. Security is a significant problem with BYOD policies. When you’re dealing with personal devices, you don’t control the operating system, whether they’re up to date, or any number of potential security holes that exist. Before allowing BYOD into your small business, you need to create a policy that addresses these issues. According to Small Business Computing, a mobile device management strategy needs to cover the common BYOD circumstances. For example, don’t allow newly terminated employees access to your systems. Remove access to the network immediately to prevent any potential issues. Another way to implement security measures is to promote a culture of safety and security. Teach your employees how to avoid hackers and other issues that occur with mobile devices. You want them to know it’s possible for personal identity theft to occur as well, so learning about loan fraud and other issues that may occur due to a security breach is quite important. Sticking to your policy is the most important part of this process. This may be hard if your employees are especially resistant to change, or insist that the way they handle things is the proper way. You want to control network access and provide a list of approved software to work through, instead of allowing employees complete access to do what they want. This way, you limit the amount of app-based security breaches that you are inviting into your business. It will take some time for your employees to adjust to the new culture, but it’s well worth it for the BYOD benefits. Bobby’s a Web developer who blogs about mobile technology from his home in northern California. Aepiphanni is the trusted advisor for business leaders who are seeking forward-thinking solutions to help them plan for and navigate through the challenges of business growth. Our entrepreneurial multidisciplinary team works with clients to develop differentiating solutions and provide direction focused on lasting, strategic results. We exist to help our clients CREATE | DESIGN | BUILD extraordinary businesses.